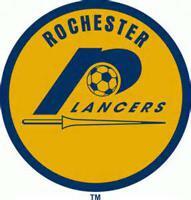 The Rochester Lancers were a soccer team based in Rochester, New York that played in the American Soccer League from 1967 until 1969 and the North American Soccer League from 1970 to 1980 at Aquinas Stadium (renamed Holleder Memorial Stadium in 1974). They were owned by Charlie Schiano (majority stake), Pat DiNolfo, Nuri Sabuncu and Tony Pullano. After three years competing in the ASL, the club jumped to the newer NASL and won the league championship in their first season. They followed that up with a division title the next season and a second consecutive MVP award for forward Carlos Metidieri. During the 1971 NASL playoffs, the Lancers won the longest game in NASL history, 2–1. Game 1 of the best-of-three semifinal against the Dallas Tornado was mercifully ended by league scoring champion Metidieri late in the 6th overtime period, in the 176th minute, less than four minutes shy of playing two complete games in one day! A week later Rochester lost the deciding Game 3 in the 148th minute of a 4 OT battle. They were the only NASL club in history to participate in an international tournament, in the 1971 CONCACAF Champions' Cup where they finished in fourth-place. The Lancers could not sustain their early success through the rest of the decade. Posting only a couple of winning records and a few playoff appearances, the team folded after the 1980 season. However, starting in 1978 most of the Lancer lineup competed in the NASL's off-season as the New York Arrows of the Major Indoor Soccer League; under that name the squad lasted until 1984 and won several championships in the other league. A new team named after the Lancers began play in November 2011 in the third Major Indoor Soccer League. March 19, 1971 the league staged its first ever indoor event, a four-team Hoc-Soc tournament at the St. Louis Arena. Rochester won its first match, 3–1, before falling to the Dallas Tornado, 3–0, in the Final. In the winter of 1975, the NASL ran a two-tiered, 16 team indoor tournament with four regional winners meeting in a "final-four" style championship. Despite hosting their region at the Rochester War Memorial Arena, the Lancers did not progress out of the group. In 1976 the Lancers advanced all the way to the finals before being beaten 6–4 by the host Tampa Bay Rowdies at the Bayfront Center. The NASL would not sanction a full indoor season until 1979–80, but the Lancers did not participate. Jump up^ Flachsbart, Harold (March 20, 1971). "Fans Get A Kick Out Of Hoc-Soc". St. Louis Post-Dispatch. p. 6. Retrieved August 14, 2016.